Mattress of medium hardness from the BASIC mattresses series. Its construction features Bonnell springs and provides stability, ensuring proper body posture during sleep. It's an anti-allergy surface - skin-friendly. An ideal case that combines simplicity and economy for those looking for a layer for non-daily use. 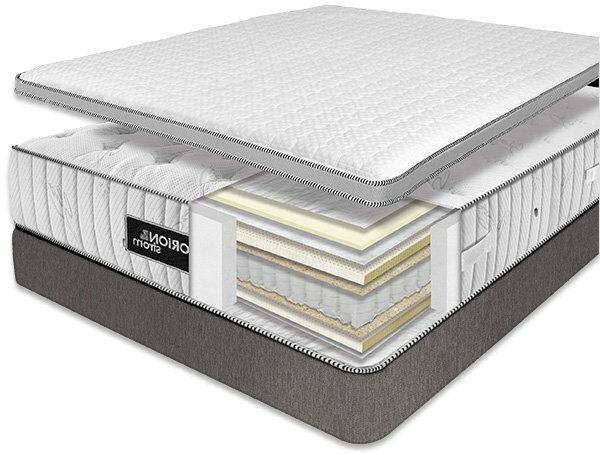 The second member of the Basic series is a medium hardness mattress made of Bonnell springs. Economical choice that offers simplicity and cool temperature. It has an anti-allergic structure made from raw materials that are perfectly environmental-friendly for human skin. A reliable solution special designed for non-daily use. Enhanced to withstand more weight, the Basic Extra anatomic mattress is a simple and affordable option for restful sleep. With a 2.4 mm Bonnell springs construction, it provides strength and better fitting to the body, an advantage that makes it stand out among others in its class. It is an anti-allergy mattress that "breathes" properly, does not trap hot air and is ventilated, keeping cool temperatures. Classic Cotton Plus anatomic mattress from the Classic series that ensures comfortable and pleasant sleep. Featuring 2.4 mm Bonnell springs, it is capable of holding higher weight. Its top quality natural cotton casing offers gentle contact with the body and ensures antibacterial action, helping to keep the temperature cool. It is an anti-allergy layer, completely skin-friendly. Comfortable mattress with latex and coconut content inside. It consists of 2.4 mm Bonnell springs offering elasticity and strong grip when you lie down. The outer casing of natural cotton protects against microbes and ensures gentle sensation in every contact to make you feel comfortable. It is an antiallergic layer with enhanced hardness for those who want a more stable feeling during sleep. Comfortable mattress of medium hardness with outer fabric of natural cotton that gives a soft feeling to your body. Its content of specially treated latex ensures that the soft feeling will last a long time. Its Bonnell springs provide hardness and durability for your body. Anatomic mattress which supports the body muscles and backbone, restoring it from painful movements over the day. The velour outer layer of the Best Mattress Series offers economically the sense of softness that everyone wants from its mattress. In its simplest version, the Best Anatomic Mattress features a Bonnell-type springs and friendly body-like behavior. Ventilated to "breathe" properly and keep its temperature low, with anti-allergic properties to stay skin-friendly. Featuring HR technology, the Best Mini Bonnell HR foam mattress raises the quality index in the Best range, since it can maintain its softness in relation to the rest of the foam. Made of Mini Bonnell springs, it provides higher levels of strength for comfortable and durable body hold. It is an anti-allergic and ventilated layer that allows it to stay at the right temperature. The combination of a velvety outer casing and latex with coconut content inside transforms the Best Coco anatomic mattress into the ideal choice for those who want a durable mattress at an affordable price. It features Bonnell springs and adapts to the body so you can enjoy a better resting effect. It is anti-allergic and skin-friendly, while it is a ventilated layer that does not contain harmful elements from the atmosphere. Coco 3D anatomic layer from the Best Series, thanks to 3D Border technology, features enhanced external strength. It consists of Bonnell springs and a construction that has the ability to adapt to the body. Contains coconut and latex, both ensure a quality feel when you are on top of it, as it does not retain wetness. It is a ventilated mattress that 'breathes' properly by keeping the temperature low even in a warm environment. The softer layer from the Best series offers ideal moments of relaxation for those who want fluffy and deep lying. The velvety outer casing, combined with foamy content, gives you extra gentle feeling. With its anatomical structure it is possible for the mattress to adapt to the body. It is a ventilated layer that eliminates harmful elements from the atmosphere, "breathing" properly to stay healthy and cool.